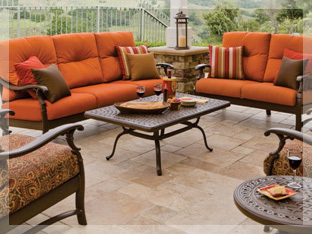 We Create A New Look With Your Old Patio Furniture For About 1/2 The Cost Of New. To restore your furniture we use powder coat paint and re-strap with new 100% virgin vinyl. For slings we use a Phifertex material, and for cushions only Sunbrella fabrics. Some of the brands we refinish are: Alumont®, Brown Jordan®, Mallin®, O.W. Lee®, Sundrella®, Tropitone®, Winston®, Woodard® and more. 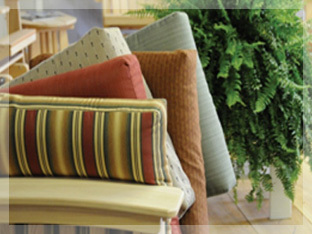 These cushions are all handmade to fit your furniture just right. Only the best fabric from Sunbrella® is used. You have your choice from many styles and colors, all of which are guaranteed to be of the highest quality and affordability. Each sling is tailored for the specific piece of furniture so the fit is just right. Many beautiful fabrics are available to choose from, as slings are made at our factory in our upholstery shop. Since 1983, Patio Furniture Doctors of the Palm Springs Area provides patio furniture repair and refinishing services to preserve your pieces. We pride ourselves on adding beauty to your furniture for about half the cost of new. Whether it’s completely refinishing or just re-strapping, new slings, custom cushions, new umbrellas, or tabletops, we can do the job! 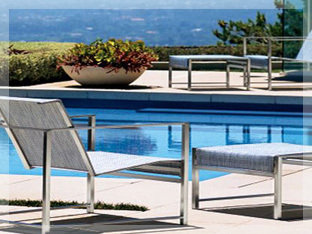 One call to the Patio Furniture Doctors, does it all, as we repair pieces for homes, community associations, hotels, and country clubs at competitive prices while guaranteeing the best service. So whether you’re a homeowner or property manager, you can expect to be treated with integrity and honesty. Patio Furniture Doctors is dependable and reliable, as we believe it’s not the quantity of equipment or employees one might have, but the quality of the completed job! We are founded in Palm Springs and now serve all of Southern California. We stay loyal to our roots and have pick up and delivery throughout the Palm Springs Area; Rancho Mirage, Palm Desert, Bermuda Dunes, Indian Wells, La Quinta and Indio.